Puffy eyes can naturally occur from allergies like hay fever, and knowing how to treat them correctly can mean the difference between feeling and looking refreshed and having unsightly inflammation that lasts for hours. Using natural remedies made from simple household items can reduce swelling naturally in a way that is safe for use around the eye area. Steep two teabags in a mug of hot water for 3-5 minutes. Squeeze excess tea from teabags. Put teabags on a plate and place in the refrigerator for 20-30 minutes or until teabags are cold. Lie down on a couch or lean back in a comfortable chair. 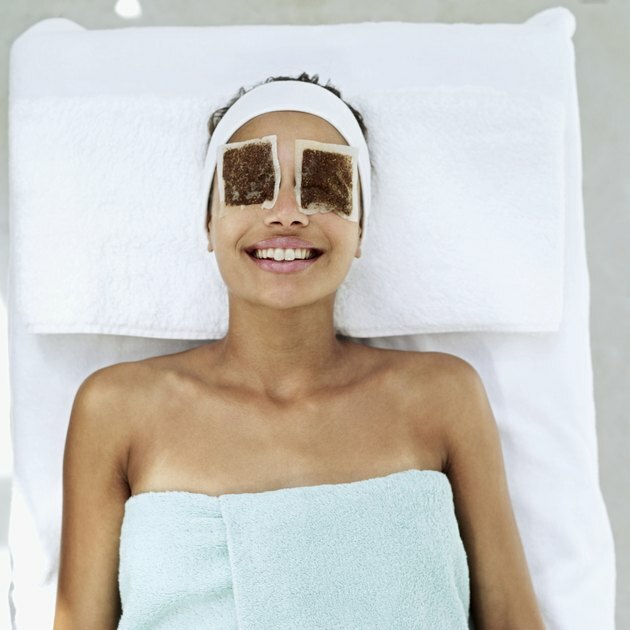 Put a teabag over each eye and let them sit for 15-30 minutes with eyes closed. Remove teabags from eyelids and wipe excess tea from eyes gently with a damp hand towel. Keep damp towel close when teabags are resting on eyelids in case you need to dab at excess moisture. For those with extra sensitive skin, test your teabag out on a non-facial patch of skin to make sure this method is right for you. Those who suffer chronic eye puffiness may need to seek additional anti-inflammatory methods like an antihistamine to reduce swelling. Glamour: Wait! Don't Toss That Tea Bag Into The Trash!